View of “Julia Haft-Candell: the infinite,” 2017. A glossary that accompanies this exhibition opens with lines from Ursula K. Le Guin’s introduction to her 1969 novel The Left Hand of Darkness: “I am an artist too, and therefore a liar. Distrust everything I say. I am telling the truth.” Julia Haft-Candell’s thirty sculptures similarly operate as a collection of playful hypocrisies, suggesting that the gray area between binaries is more productive terrain than any stable point. From the “Infinity” series (all works 2017), twenty-four of the symbols, in black clay, rough and burnt-looking, appear in a tight grid of plinths on one gallery wall. 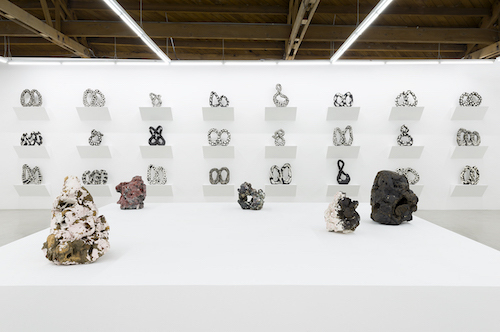 The artist observes a strict palette of black and white, and the presentation is similarly meticulous and clinical, offsetting pretzel-like loops, tripled chains, and complicated knots. Each sculpture bears a distinct, tactile pattern, including waves, combs, and arches, which Haft-Candell poetically elaborates on in her glossary. As a counterpoint, the ceramics series “Weights” is arranged on a large platform on the opposite side of the room. Done in pinks, reds, grays, and browns, the “weights” are mossy and sludgy, like renderings of bits of another planet. She details the mythological significance of each shape in her pamphlet, and ascribes historically gendered readings to them. Defining the infinity symbol as masculine and feminine, or a visualization of androgyny, she notes: “Its definition is not fixed, but constantly changing and multiple, embodied in one concept.” Contradictions such as order and disorder, eternity and the here and now, are cleverly coated over the artist’s intention. Here, Le Guin’s Darkness, which describes a world of ambisexual inhabitants, underscores sculptures that toy with their identities through layers of meaning.